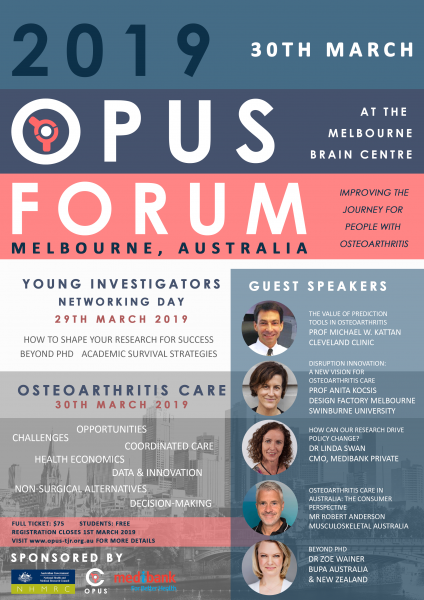 Over two days, OPUS will be hosting the inaugural OPUS Forums where you can network, consider your career in research and explore how to improve osteoarthritis care in Australia. Grab a flat white and catch a tram to The University of Melbourne (Parkville, VIC) on the 29th March 2019 for a Networking day with like-minded young investigators studying musculoskeletal clinical research. The first day of the 2019 OPUS Forum is the perfect platform for emerging researchers to share their work on osteoarthritis care. Come back on Saturday 30th March as we break down the management journey, share the latest news in research and consider how to improve the model of care for better patient outcomes. Full registration over two days are $75, students free. Includes access to sessions, online material and catering for both days. Prizes for outstanding poster presentations and travel grants will be awarded to support young researchers. For further information, visit: www.opus-tjr.org.au/2019-opus-forum.